The six astronauts aboard the International Space Station can't come home for the holidays, but they're doing their best to make the season bright hundreds of miles above Earth's surface. The spaceflyers have decked the halls of the $100 billion orbiting lab, and — like many of us Earthbound folks — they plan to celebrate Christmas with a party and a feast. 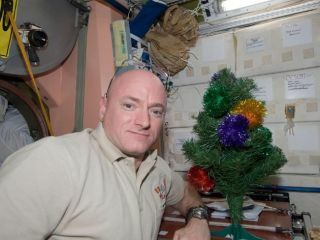 "We've already put up decorations, and we've gathered together all the cards and gifts that our friends and families have sent to us, and we're planning a couple of big meals," NASA astronaut Dan Burbank, commander of the space station's current Expedition 30 mission, said last week. "That'll be great." Burbank and two cosmonaut colleagues, Anton Shkaplerov and Anatoly Ivanishin, had been holding down the orbital fort by themselves until Friday (Dec. 23). The addition of American Don Pettit, Russian Oleg Kononenko, and Dutchman Andre Kuipers brought the space station back up to its full strength of six crewmembers. The three newcomers will contribute some Christmas cheer to the festivities, but little in the way of actual presents. "In terms of gifts, when you're off in the frontier, you're not going to waste upmass on something like that," Pettit told SPACE.com in a preflight interview. Despite those mass constraints, a fair bit of holiday flair has made it up to the orbiting lab since NASA and its international partners began building the 431-ton structure in 1998. There's even a two-foot-tall artificial Christmas tree beneath which a present or two can be wedged. The holidays can be tough for people separated from their friends and family — and zipping around the planet 240 miles (386 kilometers) above your seven billion fellow Earthlings imposes a special kind of separation. But Burbank said he and his other crewmembers don't feel too lonely or isolated. "In a very real sense, we're not far from those who care about us," he said. "For one thing, we have hundreds of people worldwide in control centers watching over us and our space station 24/7. And we also know that our families and friends are thinking about us and supporting us every step of the way." Besides, if the crewmates ever start feeling down, there's always that amazing view out the window. "Our planet is so beautiful, peaceful and serene when you look at it from space — the most beautiful holiday card you could imagine," Burbank wrote Dec. 17 on the astronaut blog Fragile Oasis. SPACE.com assistant managing editor Clara Moskowitz (@ClaraMoskowitz) contributed to this story. You can follow SPACE.com senior writer Mike Wall on Twitter: @michaeldwall. Follow SPACE.com for the latest in space science and exploration news on Twitter @Spacedotcomand on Facebook.